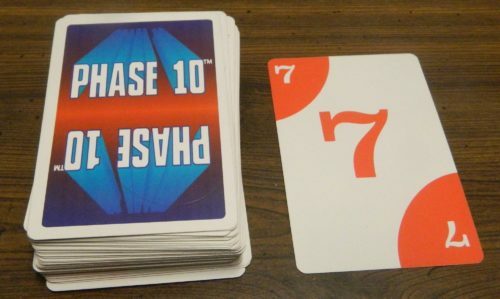 Released back in 1982 Phase 10 is one of those games that kind of surprises you with how popular it actually is. I have never really considered Phase 10 to be a popular card game and yet the game still sells well despite being over thirty years old. Phase 10 seems to be one of those type of games that some people truly hate while other people really enjoy it. Having never played Phase 10 before I decided it was about time to try the game and see for myself. While Phase 10 has a lot of problems, it is a decent game if you are looking for some mindless fun. Shuffle all of the cards and deal ten to each player. The rest of the cards form the draw pile. The top card from the draw pile is turned over and placed next to the draw pile to create the discard pile. The player to the left of the dealer starts the round. A player begins their turn by drawing a card. They can either take the top card from the draw or discard pile. After looking through their cards the player will choose one of their cards to discard. The current player can choose to either take the seven card that is face up or take the top card from the draw pile. Sets refer to cards of the same number so a set of three would be three cards of the same number. A run is a group of cards in numerical order so a run of four could be 2, 3, 4, 5. If a player has a wild card it can represent any number or color to help complete a set, run or a group of cards of the same color. The top group of cards are a set because they are all sevens. The bottom group of cards are a run because they are in numerical order. When a skip card is discarded the player who discarded it chooses whose next turn is skipped. 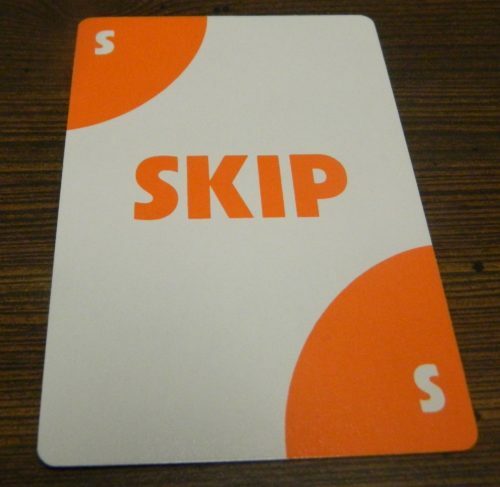 A second skip card cannot be played against a player before the player’s first turn has been skipped. No player can take a skip card from the discard pile. When a player has completed their phase the player can lay down all of the cards used to complete the phase. The player can also lay down additional cards along with their phase if they can be added to the cards already in the phase. For example if a player has a set of fives the player can play additional fives to their phase. 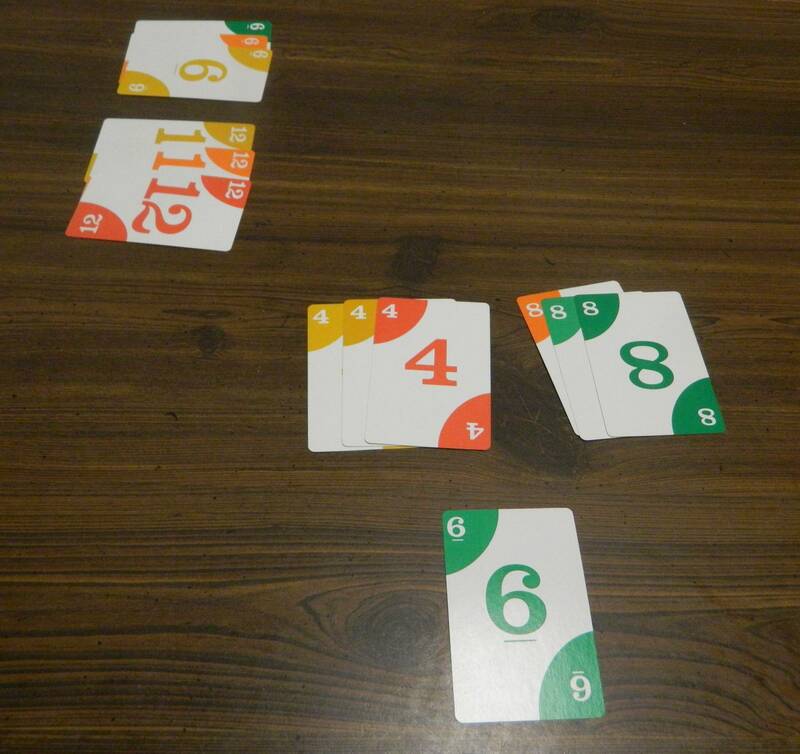 The player can also add numbers to the beginning or end of a run or additional cards to a group of cards of the same color. This player has completed phase one as they have played two sets of three. They now have to try and get rid of the rest of the cards in their hand. After a player has laid down a phase they are unable to try and finish the next phase. Instead the player will try to get rid of the rest of the cards in their hand. Once a player has laid down their phase they can add one or more cards per turn to their own phase or a phase played by another player. A player can add the same number to a set, add a number above or below a run, or add a card of the same color to a color group. The bottom player has completed their phase so they are able to add their six to the set created by the player on the left. The hand ends when one player gets rid of the final card from their hand. This player has won the hand. The other players will score points for each card left in their hand. Another hand is then played. All of the cards are shuffled and are dealt out to the players. Every player that completed their phase will move onto the next phase for the next hand. The game ends when one player has completed all ten phases. If two or more players complete all ten phases in the same hand the player with the fewest points wins the game. 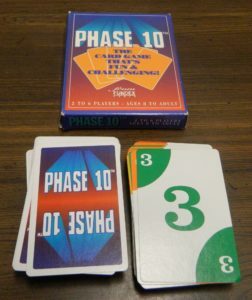 When you look at Phase 10’s gameplay it plays a lot like most simple card games. The goal of the game is to complete your current phase for the round. 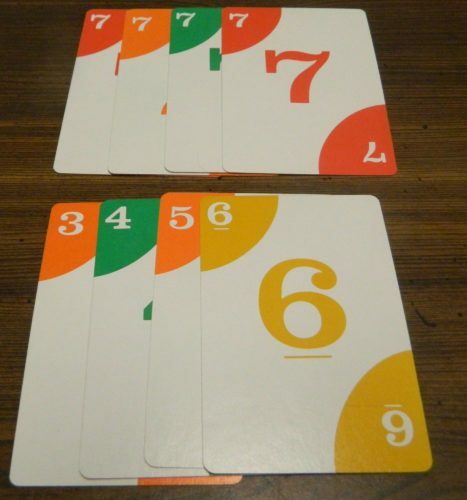 These phases involve getting sets of the same number, getting a certain number of cards in a row, or getting a certain number of cards of a particular color. Each player’s turn is really simple as you draw a card and then discard a card. When a player completes their phase they try to get rid of the rest of their cards in order to avoid scoring points while preventing other players from completing their phases. 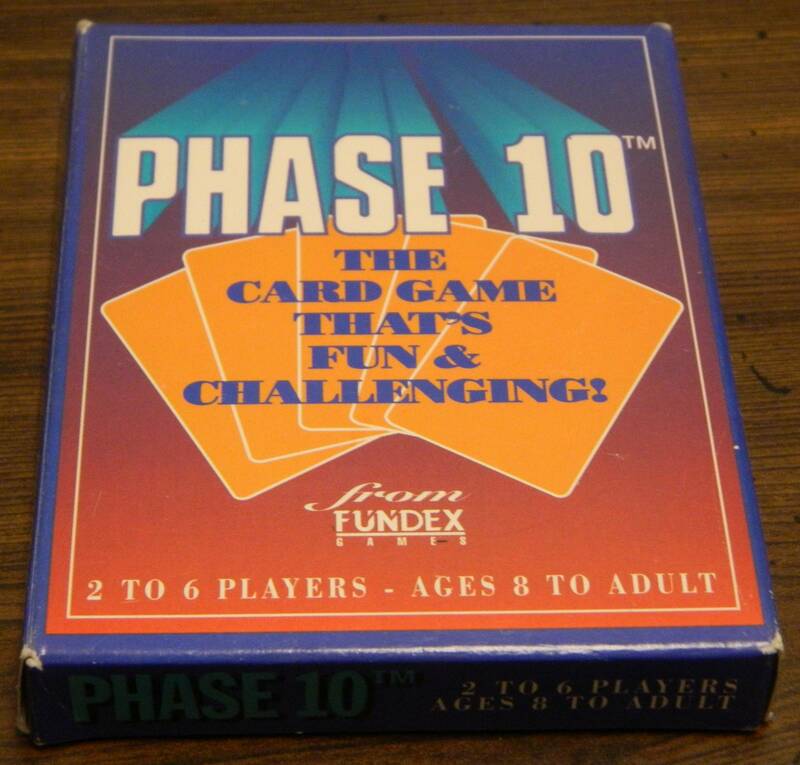 With Phase 10 being a simple card game it is not surprising that there isn’t a lot of strategy to the game. Mostly each player is just focusing on completing their own phases. Players basically only make two decisions each turn. First they have to decide whether they want the top card from the discard pile or whether they want the top card from the draw pile. This is usually pretty obvious since the only reason to take the top card from the discard pile is if it is going to help you. The other decision a player has to make each turn is which card they are going to discard. This is actually the only part of the game that actually has any real strategy to it. Usually the decision is pretty obvious as you can get rid of a card that you aren’t going to use to complete your own set. Some strategy comes into play if you consider what cards the player next to you is collecting. You don’t want to discard cards that they could use to complete their phase. At the beginning of a hand though you have no idea what the other players are collecting so all you can do is guess what card is best to discard. Later in a hand though you might be able to use prior knowledge to decide which card is best to get rid of. Other than depriving your neighbor of a card they need there are a couple other things to consider before discarding a card. If you care about your score (which is only used as a tiebreaker) you probably need to consider ditching cards that are worth more points. You also need to consider whether the card could be played onto another player’s phase after you have completed your phase. If you have a card that you can add to the cards already played in front of another player you should consider keeping the card since it will be much easier to get rid of. While there is some light decision making in the game, like a lot of these type of card games Phase 10 relies pretty heavily on luck. If you draw the right cards or have the player next to you discard cards you need, you have a better chance of winning the game. Basically your decisions are more about not making a mistake and helping another player than helping yourself. The decisions to help yourself are usually so obvious that they don’t have a big impact on the game. Without a doubt the biggest problem with Phase 10 is the fact that the game is way too long. With simple card games like this you would expect them to last maybe 20-30 minutes. Games of Phase 10 are likely going to take at least 90 minutes and that is being generous. With four or more players I could easily see the game lasting two hours. It is ridiculous that such a simple card game should take so long. At around the thirty minute point you begin wishing that the game was already over and most people might just call it quits at that point. So why does the game take so long? Each hand is usually pretty short lasting only a couple minutes with the later hands taking a little longer. The problem comes from the fact that you have to play so many rounds in the game. At the very minimum you have to play ten rounds if you are following the normal rules for the game. Good luck having the game ever end after ten rounds though. For the game to end after ten rounds a player has to somehow complete their phase in every hand. That has close to no chance of happening. Most likely you will have to play at least 15-20 rounds up to a maximum of 60 rounds if you play with six players. Under the normal rules I can never recommend playing Phase 10 since I find it hard for anyone to want to play the game for 90 minutes. If I were ever going to play the game again I would have to use some sort of variant/house rule in order to shorten the game. The designers must have known that the game had a length problem so it added some variant rules. 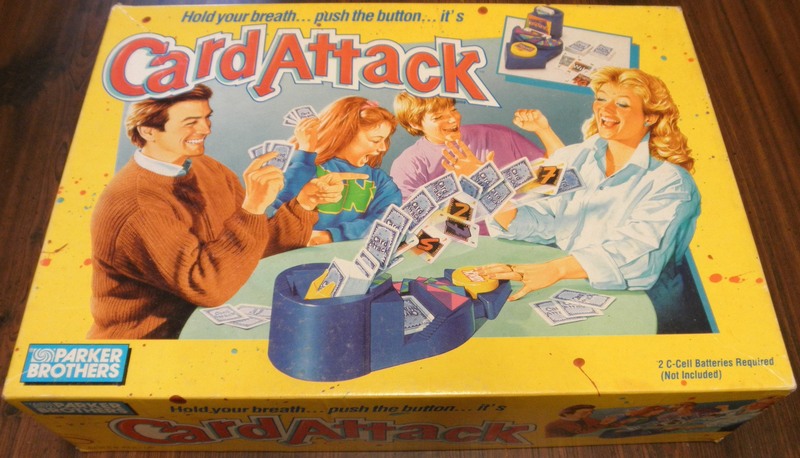 The first variant is to play a certain number of hands and the player who has the least amount of points wins the game. I don’t think this would be very satisfying because the goal of the game is to reach the last phase. The other two variants involve eliminating some of the phases. I didn’t try either of these variants but I think you have to use one of them because 10 phases is too many. Honestly I think the game would have been better if the main game only featured five or six phases. The game then could have had a variant rule to add the additional phases if players wanted to play a longer game. While on the topic of variant rules I want to talk about the scoring system. Before playing the game I knew it was going to take a long time so I decided to add a variant rule ditching the scoring system entirely. I thought it wasn’t worth the hassle of keeping the scoring if it was just going to be used as a tiebreaker. While this gets rid of the tiebreaker system it does speed up the game in a couple ways. First you don’t have to take time counting up the points after each round. Eliminating the scoring system also lets you end some rounds early because if all of the players have already completed their phase there is no point of continuing to play the hand. The third unintended way that it speeds up the game is that it actually encourages players that have gone out to work together since the sooner one of them goes out the fewer chances another player has of completing their phase. Eliminating the scoring system does have some drawbacks though. Without the scoring some of the strategy is eliminated since there isn’t as much of an incentive to be the first player to get rid of all of your cards. You don’t have to worry about keeping valuable cards since they won’t hurt you. I can see this impacting how people will play the game. Also instead of trying to go out to avoid getting points, the only reason to try and get rid of all of your cards is to prevent other players from completing their phase. Once you have finished with your phase it doesn’t matter if you or another player gets rid of the rest of the cards from their hand. The biggest potential drawback is the fact that you lose the tiebreaker so you have the possibility of a tie at the end of the game. At first I thought there was very little chance of this ever happening. With ten phases I thought it was unlikely that two players would be on the last phase at the same time. Even if they were it was unlikely that both players would finish their last phase in the same hand. As players started to get a lead in the game I was convinced that the scoring wasn’t going to matter. Phase 10 has a significant catch up mechanic built into it though. If a player falls behind early they likely can catch up pretty easily because later phases are much harder than earlier phases. The players who fall behind will be able to catch up pretty quickly as they get to complete significantly easier phases than the other players. In the game we played a player that fell behind three or four phases ended up catching up to the point that they were still in the running until the very end. While I still think it is not that likely that two players will end up tying and forcing the use the the tiebreaker, I think it will happen more than you would think. Another issue with Phase 10 is the fact that the components are just bland. I will give Phase 10 some credit since it does come with plenty of cards. The game comes with over 100 cards so you should never have a hand where you might have to reshuffle the cards. In the game I played we never even came close to running out of cards. Other than the quantity of cards though there isn’t much to the components of Phase 10. The card design is just bland. The cards basically just feature numbers with a little color to indicate the color of each card. I can see color blind people having some troubles with Phase 10. I don’t expect these type of games to have great component quality but I think a little more effort could have been put into making the cards a little more visually appealing. So I have spent a lot of this review talking about the negatives of Phase 10. These complaints are valid in my opinion as the game has a lot of problems. At the same time though I don’t think the game deserves all of the hate that it gets. Phase 10 was not designed to be a highly strategic game. It was meant to be a card game that everyone can play that doesn’t require a lot of thought, kind of like UNO. These type of games are far from my favorites but I don’t mind playing them from time to time. Phase 10 is like a lot of these type of games. While UNO is a better game, people who like UNO may also like Phase 10. Basically I see Phase 10 as the type of game that you can just sit down and play to take your mind off of your daily life. There are much better games out there but it is an okay time waster. Should You Buy Phase 10? Phase 10 is what I would consider the perfect example of an average to below average game. The game has a lot of problems. The biggest problem is that the game takes way too long. Phase 10 takes two to three times as long as it should. It is so long that I would never play the game with the official rules. The game just takes so long that it gets dull after about half an hour. You really need to implement some sort of variant rule in order to make the game’s length more manageable. Phase 10 also doesn’t have a lot of strategy and it relies pretty heavily on luck as the players who get the right cards at the right times are going to win. With all that said Phase 10 is not a terrible game. It works fine as a game that is easy to pick up and play without having to put too much thought into what you are doing. If you don’t mind mindless games you can have some fun with Phase 10. If you are looking for strategy or don’t want to bother with house rules to shorten the game, Phase 10 will definitely not be for you. If you don’t mind the occasional mindless card game though, Phase 10 may give you some enjoyment. With how prevalent the game is it should not be that difficult to find a copy for cheap. In the game of Phase 10 that I bought the two cards that list the phases are the same. This means everyone playing is trying for the same phase at the same time. Friend’s deck has several cards listing phases in different orders. Did I get a deck lacking in mixed phase cards?? Unfortunately I am probably not going to be able to help much. The version of Phase 10 that I played only had one type of card listing the different phases which is included in the “how to play” section. The rules for my version had no indication that there were mixed phase cards. As my copy was an older version of the game I have a feeling that the mixed phase cards must have been something that were added into later versions or maybe only certain versions of the game. I am far from an expert on Phase 10 though so this is just a guess. Okay, I have a question. What happens when your last card is a skip? Does it count as points to the person it given to or count as a discard? I am not exactly sure what you are asking. In the case that the skip was your last card and you discarded it (thus you have no cards in your hand), the card is just discarded and no one scores any points from it. The other players will count up how many points they earned from the cards in their hand. In the case that the round ends and the skip card is still in your hand, you will score the 15 points from it. A solid mindless card game. Doesn't have much strategy and relies on a lot of luck.